Allowing periodontal disease to take hold is a very bad idea. Not only will it eventually result in the loss of some – or all – of the teeth, it can also contribute to some kinds of heart disease! And this is not all. Anyone who has taken a trip to the dentist can attest to the pain – as well as the high costs – of the experience. As can be seen, when it comes to tooth care, prevention is definitely better than any cure. Because of this, individuals will want to get their hands on the most effective dental tools possible. This can be a daunting task, because all such tools are not created with the same levels of craftsmanship, or dedication. Luckily, the experts at the company known as Waterpik have been providing people with quality dental devices for some time, and their latest offering does not disappoint. On this Waterpik Freedom water flosser review will be taking a closer look at this amazing product, and reveal why it should be the flossing tool of choice for just about anyone. Great Cordless Flosser, highly recommended …. Check out our review on 5 of the best cordless water flosser – side by side: Click here. Why Use The Waterpik Freedom Water Flosser? There are many great reasons to make the switch to a water flosser. For one thing, they are much quicker to use and convenient when compared to the old fashion string flossing. In addition to this, the stream of water cleans the spaces in between the teeth more thoroughly than string, and thus is more effective in preventing oral disease. Another consideration is the fact that many people have sensitive gums that bleed at the slightest provocation. 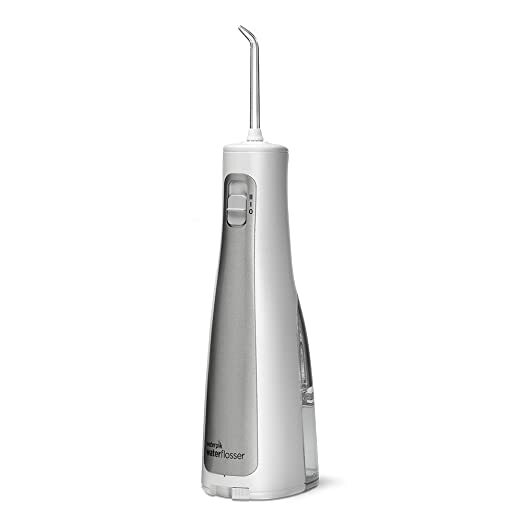 Water flossers like the Waterpik Freedom come with several pressure settings, and this allows individuals to select the setting that is most appropriate for their level of dental health. The portability of the Waterpik Freedom means that it can be used anytime – and anywhere – when the user needs it. Since mouth bacteria never take time off, having the ability to use this tech marvel after every meal will help to make teeth – and gums – healthier than ever. And that’s not all. It’s lightweight and small size make it perfect to take along on vacations, as well as business trips. Works with 3x AA batteries. This means that even if you travels to places without electricity, you’ll still be able to keep your mouth pristine. Hikers, kayakers, mountaineers, and anyone else that spends extended periods of time in the wild will find this to be quite a luxury. Since the Freedom Water flosser uses standard AA batteries, which means you can buy batteries and use it where ever you are in the world. The batteries are not rechargeable so no need plug it in an electrical socket. This will help you avoid those irritating international voltage and power outlets restrictions! Yes! You guessed it, it can be used in the shower just like the Waterpik showerpik. That means, you don’t have to mess all over your bathroom if you’re still new to water flossers. If you want, you could use it in your pool tooJ. Great for people with dental prosthetics. Many individuals have a need for things such as dentures, braces, implants, and other prosthetic devices. The Freedom can thoroughly and gently clean all of these fixtures, and with a minimum of fuss. Comes with specialized tips. These allow people to truly customize their water flossing needs to their personal circumstances. 2 x Classic Jet Tips – For general use. Orthodontic Tip – Best for cleaning around braces. Learn more about different kind of tips and their use here. Since it’s meant for “travellers”, a travel bag is included with every purchase. This amazing dental care tool was released as recently as November in 2015, and yet it already boasts an Amazon review rating of 4.4! Judging from this – and the rave reviews – this product is definitely the real deal. Individuals that make the smart choice to obtain the Waterpik Freedom water flosser will be taking a big step towards keeping their smiles bright – for a lifetime.